This is a short discussion on the modifications to the 1910 field uniform. There is not enough space here to fully document all the variations in German uniform standards, so this piece is limited to the typical infantry uniform. The growth of the German Army from 1870 to 1914, was a quartermaster's nightmare in supply for all the different types of helmets and uniforms for all the various German regiments and branches of service. Until 1910, each German state had its own particular uniform color, belt buckle motto, and a bewildering variety of badges, armbands, and helmet plates so that each particular Regiment had some distinctive or unique characteristic to commemorate some past battle or other distinction bestowed upon it. Sometimes there were unique distinctions inside regiments. Some regiments had a Leib (Guard) Company. Another example is the grand duchy of Brunswick, the home of the 92nd infantry regiment. The 3rd battalion wore a small silver death's head plate over the brass Prussian helmet plate that the 1st & 2nd battalions were not entitled to wear. In 1910, the entire German army adopted the Feldgrau uniform, while maintaining all State and Regimental variations. The pre-1910 uniforms were also maintained for parades, law court, guard duty, social affairs and for "walking-out", or off-duty times. The military luxury of maintaining the variety of uniforms could only be supported under peacetime conditions. The outbreak of war forced the German army to simplify it's field uniform. This occurred twice in 1915, and again in 1917. This is a photo of a young Prussian N.C.O. circa 1912 in his dress uniform. His tunic is Dunkelblau (Dark Blue), his trousers are black with red side seam piping. The dark band of his hat, the standing collar and Brandenburg cuff are red. The lace trim at the collar and cuff is gold, and indicates his rank as an N.C.O. The lack of N.C.O. disks on the collar indicate his rank as Unteroffizier, a rank between corporal and Sergeant. He is wearing a marksman's lanyard with one acorn, the lowest qualification as a marksman. His belt buckle is brass with a silver badge in the center, unchanged since 1847. The badge has the Prussian king's crown in the center and the Prussian State Motto, Gott Mit Uns (God is With Us), surrounding the crown. He is wearing a bayonet and bayonet knot. The colored bands of the bayonet knot would indicate which company this soldier belonged to. The buttons on his shoulder boards would also have the company number on them. 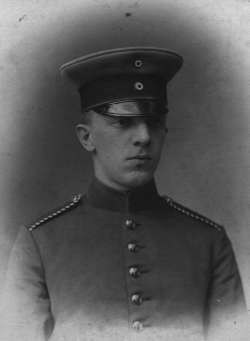 A photo of a young Prussian Einjährig-freiwillige (One-year Volunteer), circa 1903. His uniform is blue with a red standing collar. The black braid on the white piping of his shoulder boards was worn only by a Prussian One-year Volunteer, each State. The One-year Volunteer served 12 months in boot camp as a private and paid all his own expenses for food, clothing, and equipment. At the end of the year, he would have been transferred to the Reserve as an "aspirant officer", and upon completion of a two year training course would receive his first lieutenant's commission in the reserve. This was a method that a financially secure middle class family could raise their social standing in the somewhat rigid German social scene. 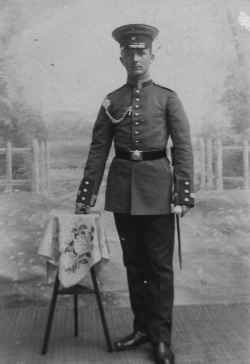 This is a Bavarian reservist, called up for service late in 1914. He is wearing the standard 1910 Fieldgrey wool uniform with Brandenburg cuffs, piped in red, and the Stehumfallkragen (stand and fall collar), a very uncomfortable back pack and leather jackboots, unchanged since 1870. The outside seam of his Fieldgrey trousers would also have been piped in red. The buttons on his tunic have the Bavarian rampant lion in place of the Prussian crown. He is wearing a leather or enameled tin pickelhaube with a brass Bavarian state helmet plate, spike, and trim. The disks on his collar, and lack of N.C.O. lace at the collar and cuff indicate his rank as Gefrieter (lance corporal). Fixed to his rifle is the obsolete quill, or feather, bayonet, it has a very thin blade and is over 24 inches long. Later the bayonet was altered to have a shorter and wider blade, the so called 'butcher' bayonet, as its shape resembled the large knife a butcher would use. His 3 section leather ammo pouches hold fifteen rounds in each section for a total of ninety rounds, a further one hundred and fifty rounds were carried in the pack. His belt buckle is iron and painted field grey. The badge in the center of the buckle has the Bavarian king's crown surrounded by the Bavarian State motto, In Treue Fest (In Loyalty Steadfast). This photo was taken in mid 1915. The soldier's Pickelhaube (spiked helmet) is covered with the canvas cover. Pre-war helmet covers would have had the regimental number indicated by a large red Arabic number. In 1914, the color of the number was changed to dark green, and in 1915, it was left off altogether. The leather used in the helmet was imported from Argentina. In 1914, the British blockade caused the first shortage of the war, leather for helmets. Felt and fibre board as well as tin or sheet metal was used as substitute materials for making helmets. Spiked helmets continued to be produced for enlisted men until the spring of 1916, when the Stahlhelm, (steel helmet), was introduced. The soldier is wearing the 1915 Transitional tunic. A wartime measure simplified the tunic and eliminated the complex Brandenburg and Swedish cuffs of the 1910 uniform and replaced them with simple turn back cuffs. This style cuff was well liked by the soldiers, as all military passes and other I.D. required to be shown to military authorities could be conveniently stowed away in the fold of the wide turn back cuff. Up to the end of the war the 1910, Transitional and 1915 Bluse type tunics continued to be produced. The soldier's belt buckle is the pre-war brass and silver type. Attached to his rifle is the shorter, butcher bayonet. 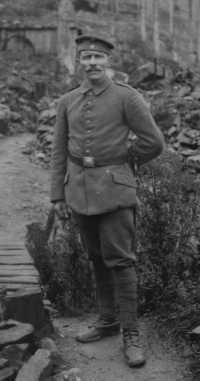 This photo is an example of a Bavarian soldier, circa 1917, wearing the 1915 Bluse type wool tunic. The cuffs turn back as in the Transitional tunic, and the brass buttons of the 1910 and Transitional tunics have been replaced with a fly front that concealed the simple buttons of horn; later in the war, wood, bakelite, or any ersatz materials were used for buttons. All metals were becoming scarce by 1916. As a result the only visible buttons on the tunic are tour zinc buttons, two at the shoulder boards and two at the tunic pockets. 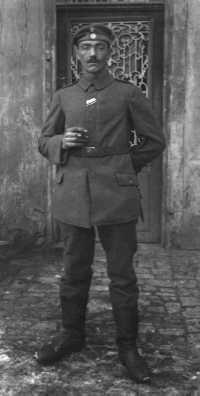 The soldier is wearing the standard German enlisted man's Feldmütze (field cap), a visorless hat. An N.C.O. would wear a similar style hat, but with a small leather visor. The feldmütze was field grey wool, with a colored band on the bottom, red for infantry, green for Jägers (light infantry), and black for artillery and Pioneers (combat engineers). 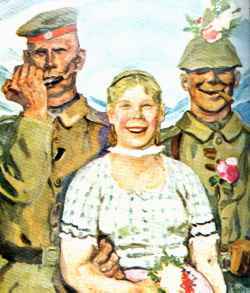 In late 1915 a grey canvas camouflage strip was issued to be tied around the red band on the feldmütze. There are two colored buttons on the feldmütze. The top button indicated the German army, the bottom button indicated what German State the soldier served. The top button is Black, White, and Red, the national colors of Germany. The bottom button is White, Blue, White, the State colors of Bavaria. Each state had its own colors, Prussian colors were White and Black. The soldiers belt buckle is iron, but painted black. In 1915, an order from the Kaiser changed the traditional brown finish of leather boots, belts and other gear to black, and belt buckles were painted black after this. Bavaria did not change to black leather until 1916. The ribbon on the soldier's tunic is the Bavarian Militärverdienstorden (Military Service Order), the Bavarian equivalent to the Iron Cross. In the field only the ribbon was worn, the medal was sent home for safekeeping. This Prussian soldier is somewhere near the front lines, but not too near or he would be carrying a gas mask in an airtight metal can. He is wearing the feldmütze, with the canvas camouflage strip, the 1915 Transitional tunic, and ankle boots with Gamaschen (Puttees). Leather for boots was in short supply to the German army. Soldiers were paid a bounty if they provided their own boots, which were usually lace up ankle boots, as illustrated here. Most storm trooper units wore this style boot in place of the clumsy jackboots. The soldier is wearing a brass and silver belt buckle. This soldier is off-duty but still carries his bayonet. A German soldier was always armed, even when off duty. Later in the war a trench dagger often replaced the bayonet for off duty times. The ribbon on his tunic is for the Prussian Eiserne Kreuz II Klasse (Iron Cross II class). In the field, only the ribbon was worn in the second button hole as this soldier does, while the medal would have been sent home. The Iron Cross 1st class had no ribbon and was generally only awarded to officers who had previously been awarded the 2nd class medal. On rare occasions the 1st class medal would be awarded to an enlisted man. A group of young soldiers from Wurtemburg pose in the photographer's studio. They are members of the 248th Regiment, a new unit created after 1916. The soldier seated on the right, and the others standing behind are wearing dark brown corduroy trousers. By 1916, many private purchase items began to supplement standard government issue clothing and boots, which were becoming more difficult to supply on a regular basis. The corduroy trousers were popular with mountain climbers, and soon with soldiers in the trenches as well. There were two types of corduroy trousers, regular straight leg trousers and a type similar to knickers in that they were loose down to below the knee, then they fit close to the calf, which worked well with ankle boots and Gamaschen. 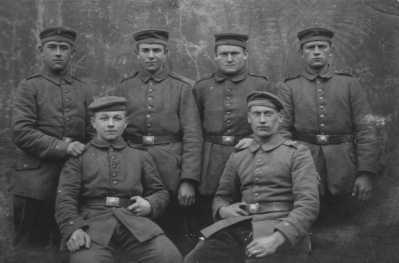 All of the soldiers are wearing the feldmütze with the camouflage strip, the state colors of the lower button was black, red, black.. Their tunics are the standard 1910 uniform with Swedish cuffs and the 1915 Transitional type. They all are wearing the brass and silver belt buckle, with the Wurtemburg king's crown surrounded by the state motto, Furchtlos und Treu (Fearless and True). 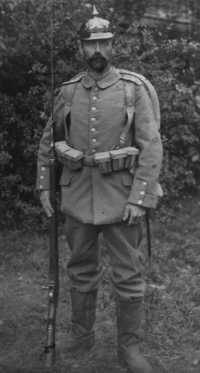 This is a very brief survey of the changes to the German infantryman's uniform and it is hoped that this short discussion is of interest.